Fitness is gaining new definitions beyond that of Body Building and Body Shaping. Andrew’s preferred style of training is formed around performance and function in life and sport/ activities that take place outside of the gym environment. 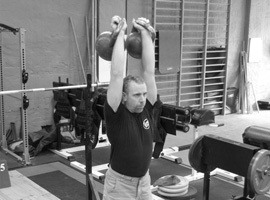 Training individuals for functional movement efficiency through strength and conditioning that has a foundational effect for all athletic needs. Aims in personal training are to increase your work capacity and general fitness through diverse and unfamiliar physical challenges by using varied functional movement executed at relative high intensity. Resulting in not only the ability to perform more efficiently in life’s daily physical and mental tasks also to increase strength and power ratios and change body composition. Fitness and health should be developed through an integrated approach that offers diverse challenges. Fitness routines should develop the mental determination, functional strength, mobility and endurance needed for optimal performance in sport and in life.